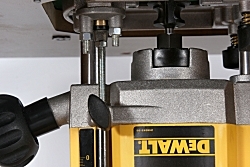 Many routers have what’s described as a three-stage turret for setting depth of cut in easy stages. Many of these turrets are, in effect, only two-stage since one of the stops is extra long for attaching a fine height adjuster. If you want to use it as a three-stage turret, remove the long length of rod and replace it with a shorter, 5mm, screw. 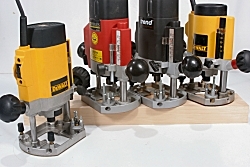 If you want to use the router in a table, with some cutters, the long length of rod might be too short to give a full range of depth setting. In this case, replace it with a longer piece of 5mm studding or cut the head off a 5mm machine screw.